There&apos;s a lot on offer on a Rhine Cruise. From the foothills of the Alps in Switzerland right to the tulip fields of Holland, you will pass romantic cities and landscapes full of history and beauty. The Rhine is Germany&apos;s longest river and rises in the Swiss Alps. It flows through Lake Constance, forms a large part of the border between France and Germany and discharges into the North Sea at Rotterdam in the Netherlands. The best time to travel on the Rhine is between April and October, but we also recommend going during the carnival season or during advent when the beautiful Christmas markets are on. Our tip: visit the region at the time of "the Rhine in Flames", an enormous firework display and spectacular event. The cathedral city of Cologne, one of Germany&apos;s oldest cities, is a common starting point of Rhine River cruises. There you can visit the largest Gothic church in northern Europe, the UNESCO World Cultural Heritage site of Cologne Cathedral, with its relics of the three kings, or one of Cologne&apos;s principal museums, for example the Roman-Germanic Museum or the Chocolate Museum. Düsseldorf offers its visitors much more than the multifaceted shopping opportunities on its famous Königsallee ("Kö"); art lovers will also get their money&apos;s worth in the numerous museums and galleries. From the Goethe Museum to the film Museum: the city offers great diversity and high-quality culture. The Media Harbour will captivate you with its bold and unusual architecture, and is one of the attractions of the city. Koblenz" is also one of Germany&apos;s oldest cities. Here at the Deutsches Eck, the confluence of the Moselle and Rhine rivers, a visit to the fortress of Ehrenbreitstein, which houses the State Museum of Koblenz, is also highly recommended. Stolzenfels Castle also welcome visitors. Between Koblenz and Rüdesheim you will travel through the beautiful and romantic Middle Rhine Valley. With its countless castles and ruins, the valley is on the UNESCO World Cultural Heritage list and simply bubbles with charm. 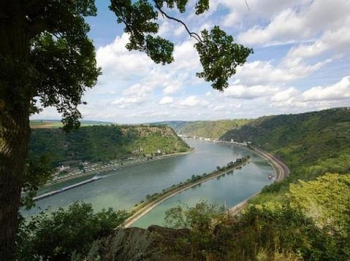 At the very latest when you pass by the fabled Loreley, the Middle Rhine Valley will have you in its spell. Romantic Rüdesheim invites you to stroll along the Rhine or through its picturesque old town. The trip by cable car through the vineyards to the Niederwald Memorial, the Germania, is highly recommended. The tourist metropolis also offers some interesting museums and more wine bars than you can count, not only in the well-known Drosselgasse but in other places too. In Mainz you will be greeted by the magnificent cathedral, a beautiful old town with half-timbered houses, numerous secular buildings and renowned museums, including the world-famous Gutenberg Museum. The Nibelung city of Worms, with its Imperial cathedral, offers a wide diversity of excursions. Visit the city&apos;s beautiful churches or museums and set out in quest of the Nibelungen and Martin Luther. Speyer, formerly one of the most important cities in the Holy Roman Empire of the German Nation, is famous for the largest preserved Romanesque church in the world, the Imperial Cathedral of St. Mary, which is on UNESCO&apos;s World Cultural Heritage list. The capital city of Alsace is Strasbourg. Here you will find, among other things, the world-famous Strasbourg Minster, the historic tanners&apos; district of "Petite France" with its narrow alleyways and half-timbered houses and the fabulous, magnificently decorated Kammerzell House. The cultural and exhibition city of Basel offers more than 30 museums, (including the art museum, the museum of antiquity and the dolls museum), as well as a very beautiful old town with cafes, bistros and shops. You should also take time on your walk to visit the courtyard of the City Hall and the Basel Minster. Due to its great popularity, including among foreign tourists, many cruise ship companies offer Rhine Cruises. The well-known and popular operators Phoenix Reisen, Transocean Tours, Nicko Tours, Anton Götten, Viking Flusskreuzfahrten, Deilmann and A-ROSA will conduct you safely, comfortably and conveniently along the Rhine.